anhydrous citric acid, benzyl alcohol, methylparaben, propylene glycol, propylparaben, purified water. This product generally produces bowel movement in 1/2 to 6 hours. presently taking a prescription drug. This product may interact with certain prescription drugs. The dose may be taken as a single daily dose or in divided doses. 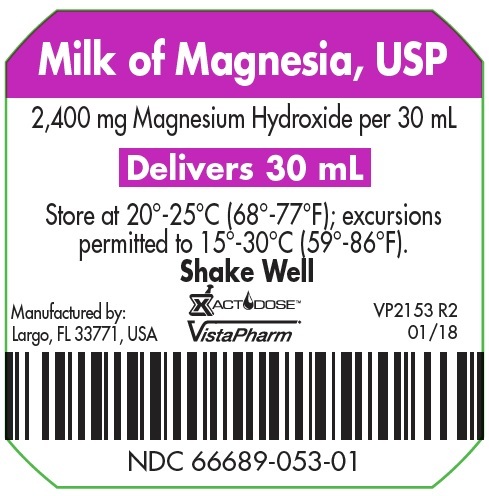 NCD 66689-053-99: Case contains 100 unit-dose cups of 30 mL (NDC 66689-053-01), packaged in 10 trays of 10 unit-dose cups each. Store at 20° - 25°C (68° - 77°F); excursions permitted to 15° - 30°C (59° - 86°F).